[127 Pages Report] The influenza diagnostics market is expected to reach USD 767.4 Million by 2021 from USD 508.0 Million in 2016, at a CAGR of 8.6% from 2016 to 2021. The increasing prevalence of influenza, growth in research funding for influenza diagnostics, and rising demand for faster diagnosis and control of influenza are the major factors that are expected to drive the market growth in the coming years. However, variability in sensitivity and specificity among influenza diagnostic tests, presence of a complex regulatory framework for the approval of new diagnostic tests, and rising healthcare costs are expected to restrain the growth of the market to a certain extent in the coming years. This report segments the market on the basis of test type, end user, and region. On the basis of test type, the market is segmented into traditional and molecular diagnostic tests. The traditional diagnostic tests segment is expected to account for the largest share of the global influenza diagnostics market in 2016. On the basis of end user, the market is segmented into hospitals/clinical laboratories, reference laboratories, and other end users (point-of-care testing, home health agencies, and nursing homes). A combination of bottom-up and top-down approaches was used to calculate the market sizes and growth rates of the influenza diagnostics market and its subsegments. All percentage shares, splits, and breakdowns were determined using secondary sources and verified through primary sources. All possible parameters that affect the markets covered in this research study have been accounted for, viewed in extensive detail, verified through primary research, and analyzed to get the final quantitative and qualitative data. Primary interviews with key opinion leaders were also used to determine the percentage shares of each subsegment and the relative differences in growth rates. Geographic analysis reveals that Europe is expected to account for the largest share of the market in 2016. This can be attributed to the rapidly increasing prevalence of influenza in Europe and rising spending on R&D by top players in this region. Similarly, Asia-Pacific is estimated to grow at the highest CAGR during the forecast period. 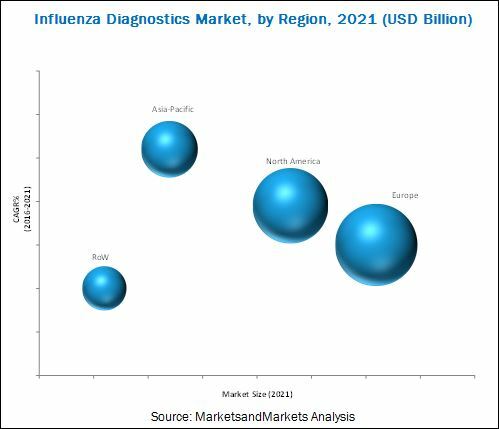 Increasing prevalence of influenza, increased healthcare expenditure, growing demand for advanced diagnostic technologies, and government initiatives are expected to drive the influenza diagnostics market in this region. The major players in the influenza diagnostics market are Thermo Fisher Scientific (U.S.), Roche Diagnostics (Switzerland), Alere Inc. (U.S.), Quidel Corporation (U.S.), Becton, Dickinson and Company (U.S.), DiaSorin (Italy), SA Scientific (U.S.), and Luminex Corporation (U.S.). 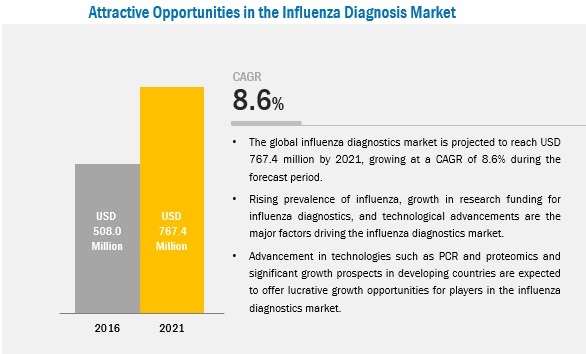 The influenza diagnostics market is expected to reach USD 767.4 Million by 2021 from USD 508.0 Million in 2016, at a CAGR of 8.6% from 2016 to 2021. The increasing prevalence of influenza, growth in research funding for influenza diagnostics, and rising demand for faster diagnosis and control of influenza are the major factors that are expected to drive the growth of this market in the coming years. However, variability in sensitivity and specificity among influenza diagnostic tests, presence of a complex regulatory framework for the approval of new diagnostic tests, and rising healthcare costs are expected to restrain the growth of this market to a certain extent in the coming years. This report segments the global market on the basis of test type, end user, and region. On the basis of test type, the market is segmented into traditional and molecular diagnostic tests. The traditional diagnostic tests segment is further categorized into rapid influenza detection tests (RIDT), viral culture, direct fluorescent antibody (DFA) tests, and serological assays. In 2016, the RIDT segment is expected to account for the largest share of the traditional diagnostic tests market owing to factors such as its user-friendliness, rapid generation of results, and easy interpretability. The molecular diagnostic tests segment is further categorized into RT-PCR, nucleic acid sequence-based amplification (NASBA) tests, loop-mediated isothermal amplification-based assays (LAMP), and simple amplification-based assays (SAMBA). In 2016, the RT-PCR segment is expected to hold the largest share of the molecular diagnostic tests market due to its ability to detect and distinguish between influenza A and B viruses with high specificity. On the basis of end user, the market is segmented into hospitals/clinical laboratories, reference laboratories, and other end users (point-of-care testing, home health agencies, and nursing homes). The hospitals/clinical laboratories segment is expected to dominate the market in 2016. The large share of this segment can be attributed to the fact that most influenza disease diagnostic tests are carried out in hospitals and clinical laboratories, as these tests are highly complex in nature and require the use of specialized instruments. On the basis of region, the market is segmented into North America, Europe, Asia-Pacific, and the Rest of the World (RoW). Geographic analysis reveals that Europe is expected to account for the largest share of the global market in 2016. Growth in this market can be attributed to the rapidly increasing prevalence of influenza and rise in aging population in this region. Similarly, Asia-Pacific is estimated to grow at the highest CAGR during the forecast period. The main factors driving market growth are the increasing prevalence of influenza, increased healthcare expenditure, growing demand for advanced diagnostic technologies, and government initiatives. The major players in influenza diagnostics market include Alere Inc. (U.S.), Meridian Bioscience, Inc. (U.S.), Thermo Fisher Scientific, Inc. (U.S.), Becton, Dickinson and Company (U.S.), QIAGEN (Netherlands), Roche Diagnostics (Switzerland), and Abbott (U.S.).